If you're in the Peckham area this lunchtime from 12:00 - or able to jump on a train down there from London Bridge - then you're in luck. Follow the scent of sizzling beef into an industrial car park, to find the Meat Wagon. One of London's, nay the world's best burgers awaits you. It's not a pop-up restaurant as such (it's a van) but Yanni only appears here sporadically, when he's not busy with other catering work and releases dates via his website or Twitter. The burgers are astoundingly good - particularly the bacon cheeseburger. 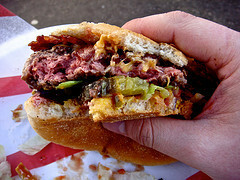 He slow roasts a ham hock the night before, and then shreds it up to make a patty that goes on top of the burger. The burger itself is 100% beef, well seasoned and fried up fresh before your eyes, four orders at a time. The cheese is a closely-guarded secret but it's definitely not cheddar. If the Philly Cheese steak is on, then it's highly recommended. Go hungry. Bring a friend. Order everything on the menu. Roll back to the station. Start planning your next trip. The Meat Wagon, Print Village, Chadwick Road, SE15 4PU. Open from 12:00 until they sell out.